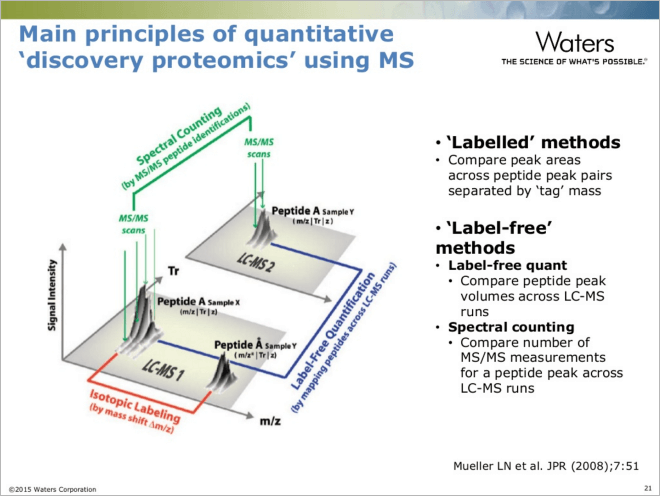 Generating proteomics data from an LC-MS platform is by no-means inexpensive, a great deal of time is invested into preparing samples, preparing the columns and optimizing the mass spec conditions to generate this complex and rich data. With so many parameters that can and do go wrong, can you really afford to throw your data into a “black box” and trust the results that come out of it? 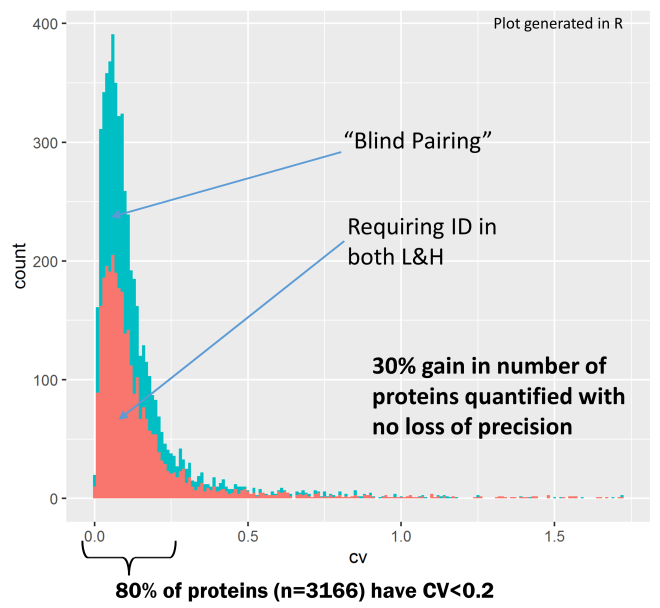 I began writing this as I flew back from Berlin having had some great conversations about the importance of data quality with scientists congregated for the Potsdam Proteomics Forum. Conversing with Progenesis customers demonstrated to me the great value that the variety of visualizations are providing. These enable results that Progenesis users are confident about. Dr. Dominik Megger from Ruhr University Bochum told me about an experiment where everything seemed fine (good TICs and good alignment scores) until protein identification was carried out and some of the runs were showing very few identifications. 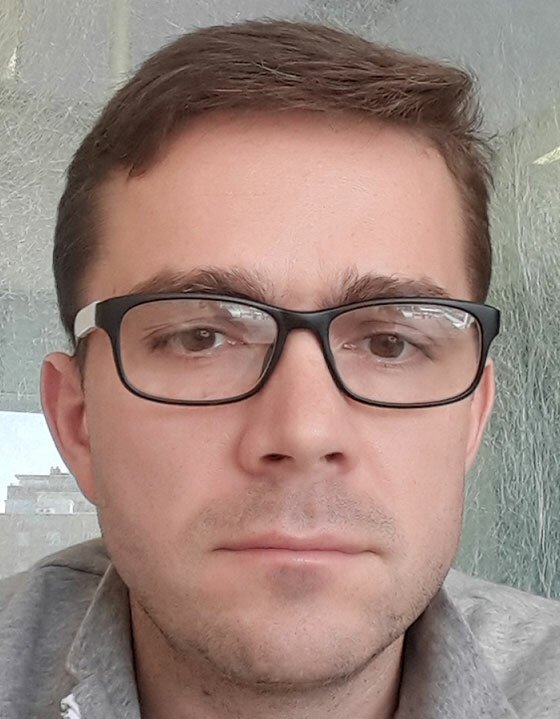 This flagged a potential issue and using Progenesis, Dominik was able to look back at the QC metrics page (fig.1) to find that for some of the samples there were high numbers of missed cleavages in Trypsin digestion, indicating that it had stopped working well. Although this was a painful realization, there was a quick resolution to what could otherwise have been a very drawn out procedure of looking back step by step through all of the things which could have gone wrong. Dominik was therefore very pleased about the time he was able to save here. Speaking to a customer from the Otto von Geuricke University of Magdeburg, highlighted an issue that we all recognize. “I do a search and get two different accession numbers for the same protein!” I can’t say that we are able to solve that issue, as it pertains to the quality of the libraries and database redundancies, however Progenesis does offer you more confidence in the assignments of peptides to proteins and therefore in the quantitative accuracy. 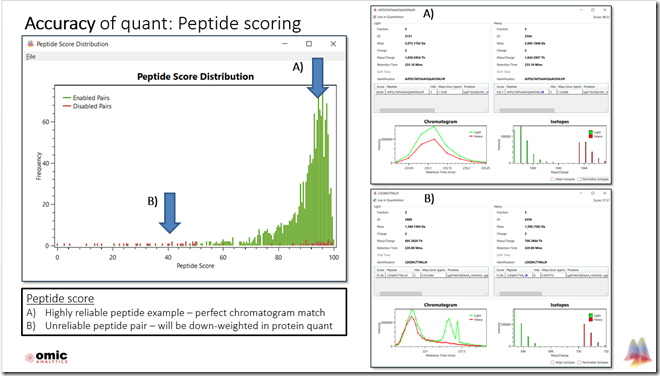 Peptide correlation scores (see figure 2) can help you remove peptides that have been incorrectly assigned to a protein. Once you have refined your dataset to the proteins of interest (those that are significantly changing between conditions), you should expect in most cases that the peptides of a particular protein should show the same direction of change, i.e. 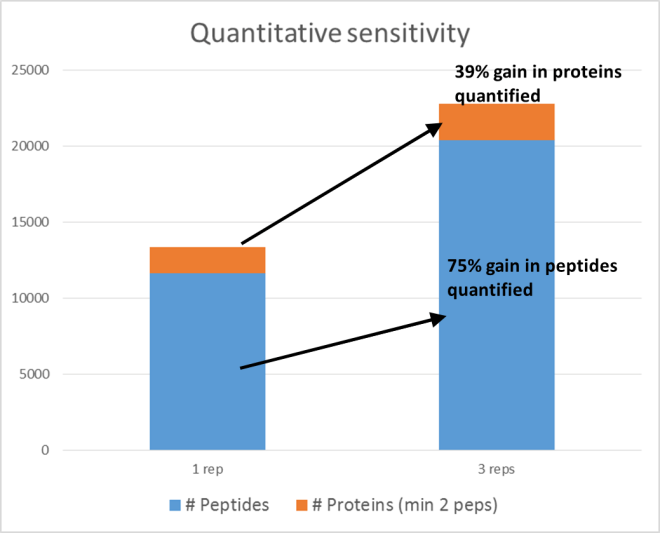 up or down regulation, so if you see a peptide that is behaving differently, you can remove it from the protein to give you better, more confident quantitation. 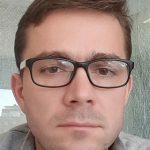 LC-MS data analysis inevitably comes with a variety of assumptions and those assumptions don’t always stand up to the test: – if your data analysis happens in a “black box”, it’s quite possible that the results are misleading you. This can result in spending valuable time researching false positives or neglecting the real interesting results due to false negatives, which are very costly. Progenesis QI software presents you with 4 crucial ways to QC your data. Before, during and after analysis. If you do need to re-run problematic samples then Progenesis is flexible enough to enable you to add those samples into your experiment at a later point, maximizing your time and resources. 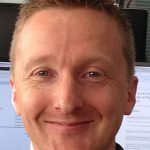 If you want to hear more from a real life example, Prof. Paul Langlais gives a very informative and entertaining account entitled ‘From the Dark to the Light: How Progenesis Added Years to my Life’, offering some great insights about how he was able to use visual QC in Progenesis to optimize the LC-MS set-up in his lab. 3) The PCA plot in the statistics screen (see figure 5) will allow you to quickly gauge whether your conditions are the primary reason for the separation in your experiment or if there is a systematic reason (/error) for separation between samples, such as the running order. The PCA plot below shows an experiment in which the samples are not clustering according to the experimental design and there are other factors that need to be controlled in order to get good results. 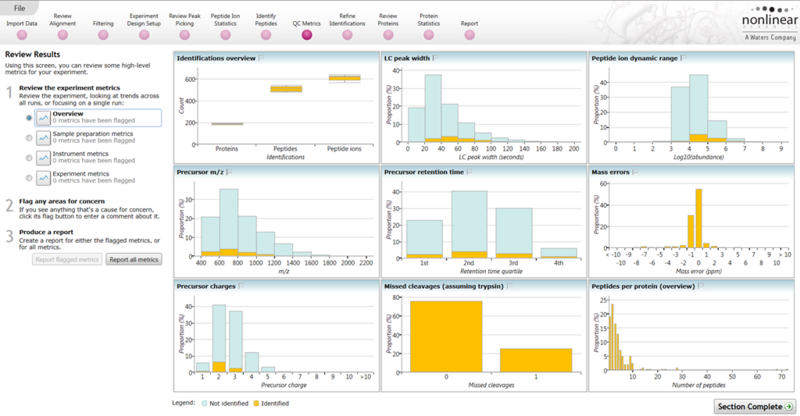 4) QC Metrics screen (figure 1), this screen offers many useful metrics to help you make sure your system is running optimally and, in case you spot something strange happening, this screen can also offer insights to help you find the cause of problems such as the trypsin degradation that our friend from Bochum picked up on. 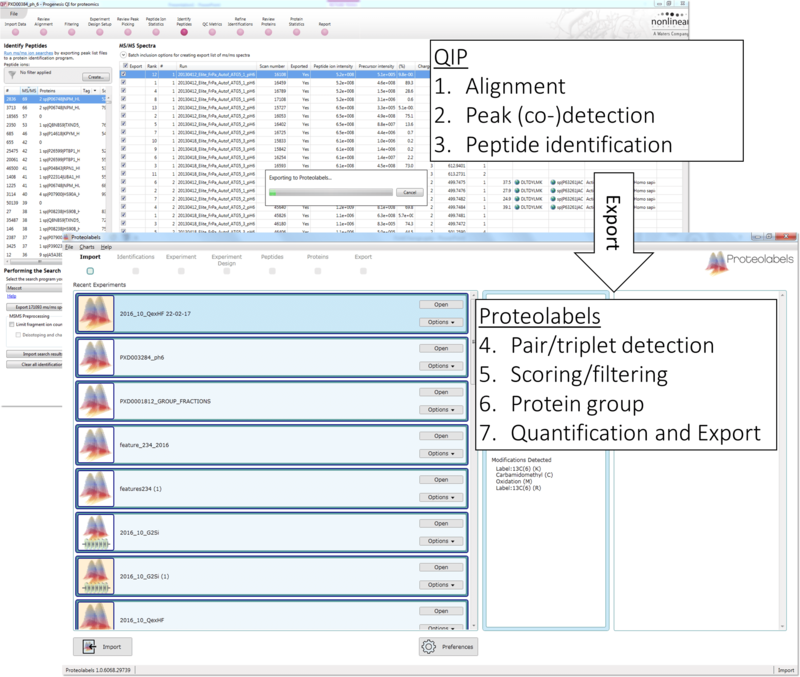 You can now confidently analyze your SILAC or di/tri- methyl labelled proteomics data with an export from Progenesis QI for proteomics into Proteolabels. You will benefit from the “no-missing-values” approach of Progenesis co-detection and gain a great advantage from Proteolabels’ ability to auto-detect and find pairs or triplets, even when only one of the doubles or triples has been identified. This, together with the many visual QC displays means that you can be confident of getting maximum information from your samples. 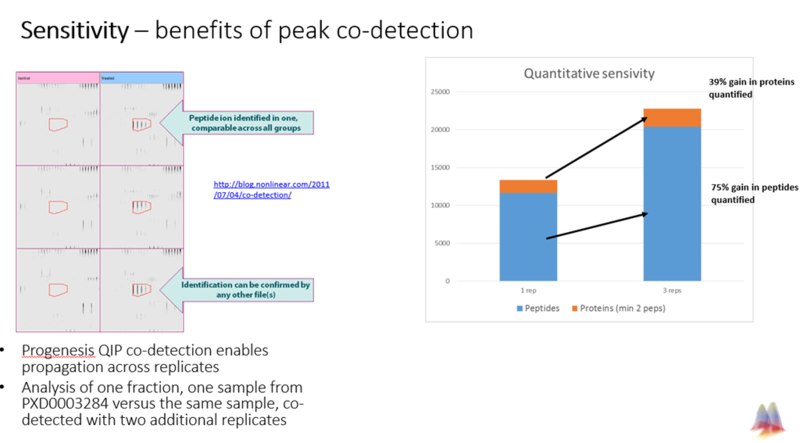 Figure 6 shows the benefit in sensitivity that you gain through Progenesis co-detection and Proteolabels. 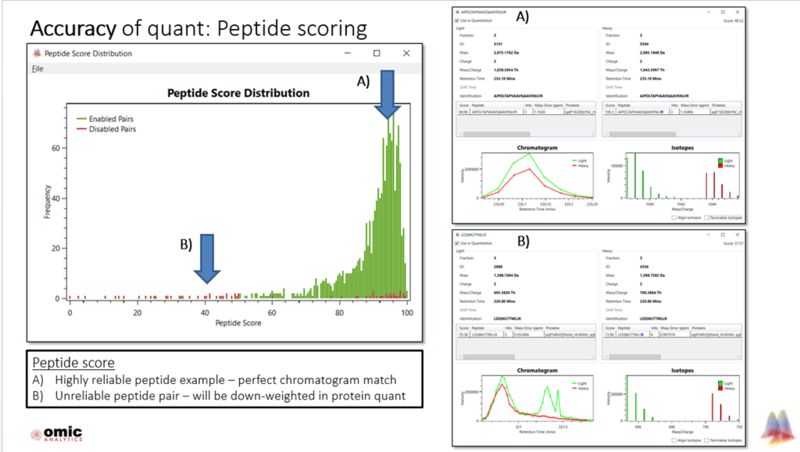 A couple of other Proteolabels features that will further increase confidence in your labelled data analysis are peptide scoring (figure 7) and the use of these scores in weighted averaging at the protein quantitation step (figure 8). Proteolabels gives many visualizations which will help you to QC your data analysis before you draw conclusions. We have only shown a few here. For more information on Proteolabels please get in touch with us via email at the address demolicence@nonlinear.com. Finally, while on the topic of data integrity, you can automate even more of your data handling using Symphony Data Pipeline, thus removing some of the manual steps where ‘things’ could go wrong. 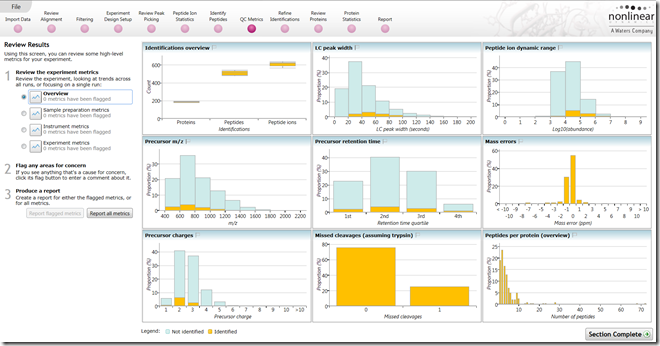 To summarize, Progenesis QI for proteomics offers data quality and assurance along with data transparency (QC metrics, alignment scores, etc. 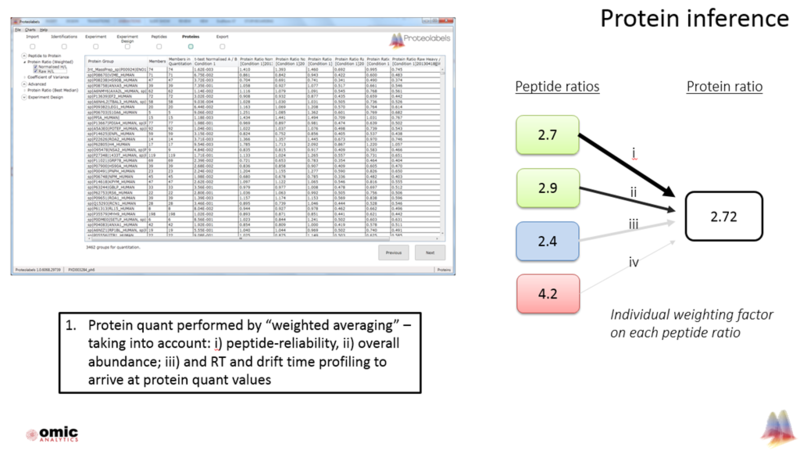 ), as does Proteolabels (peptide scoring and weighting). This also means the benefits of co-detection are extended to your labelled analysis. Symphony reduces human error of repetitive tasks, allowing you to support data quality and thereby giving you confidence and reliability in your results. If you’re using a “black-box” solution and would also like to have more transparency and confidence in your data analysis, get in touch with us by email at the address demolicence@nonlinear.com. 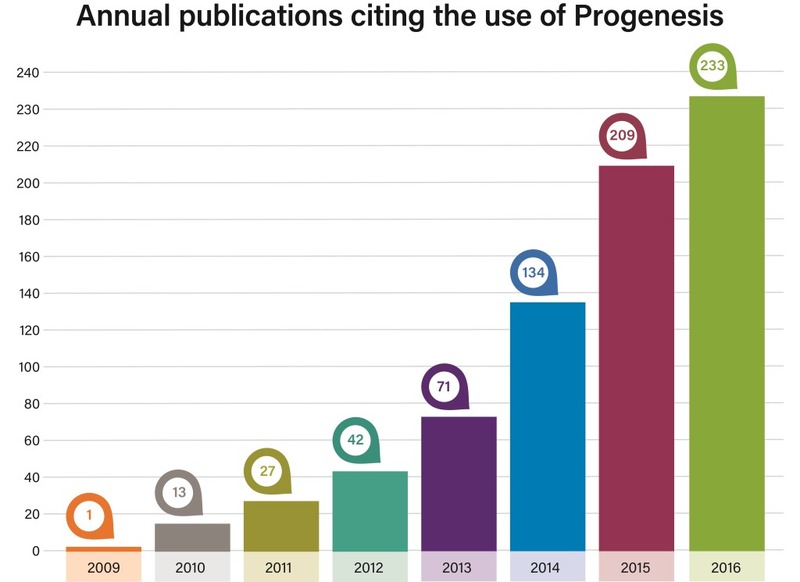 We’ve seen a huge growth of Progenesis QI sales in Asia-Pacific over the past 3-4 years and it’s good to see that this is now being followed by a similarly impressive boost in publications citing Progenesis QI from the region, particularly from China where there were 16 publications citing Progenesis QI last year and 3 already this year. Figure 1: The number of publications per year (worldwide). There have also been publications from Institutes in Japan, South Korea, Taiwan, Singapore and India in the same period. In view of this I thought it would be a good time to review the applications covered by these publications and to highlight a couple of particularly interesting ones in a little more detail. The broad application fields covered by the publications include clinical and health science, food and nutrition, plant science, natural products and environmental research. Natural products research in China is dominated by research into Traditional Chinese Medicine (TCM) for which there are large departments in many universities and even entire universities specialising in this field. The research involves investigating the mechanism of action, active ingredients and safety of traditional remedies, definitely an interesting case of “old meeting new”. Traditional remedies which may have been used for hundreds of years are now being analysed with cutting edge technology including high resolution LC-MS systems and Progenesis QI software in the hope that isolating the active ingredients and understanding how they work could lead to development of new drugs. Food and nutrition is another field where modern omics research is being applied to a traditional industry for purposes such as improving food quality and taste as well as food safety and quality control. It’s the exceptional ability of Progenesis QI to “find the needle in the haystack” – detect subtle differences in the profiles of complex metabolite mixtures that enables success in these different fields of research and analysis. I’d now like to highlight two very recent publications which illustrate the high level and quality of research being performed with the help of Progenesis QI in Asia. Firstly, a publication from China which shows that in addition to the large amount of plant and natural products research, there is also high level clinical research taking place. A group at Chongqing Medical University have performed a lipidomics study on the mechanism of Gestational Diabetes Mellitus (GDM) by monitoring changes in lipid profiles in maternal plasma throughout pregnancy. The ultimate goal is to understand the mechanism and cause of a condition which can lead to serious long term consequences for both mother and foetus. The study involved 61 participants, 34 controls and 27 diagnosed with GDM. Plasma lipid levels were monitored at different stages of pregnancy (at each of the trimesters) through separation and detection on a Waters Acquity UPLC I-class system coupled to a Waters Xevo G2 QTof MS. The data was processed in Progenesis QI including relative quantification via the unique and powerful co-detection method which generates no missing values leading to more reliable statistics and therefore better results, plus identification using Progenesis MetaScope and ChemSpider. As Progenesis QI can export data using a flexible *.csv format, sophisticated multivariate statistical analysis can easily be performed in external software to extract some meaningful results from the experiment despite the large biological variance always found in clinical studies. In this way trends in relative levels of a large number of lipid species throughout pregnancy were monitored in both control and GDM subjects and a number of polyunsaturated or chemically modified phospholipids were found to be present at significantly lower relative abundances in GDM compared to control subjects throughout pregnancy. These results will contribute to better understanding of the mechanism and causes of GDM. 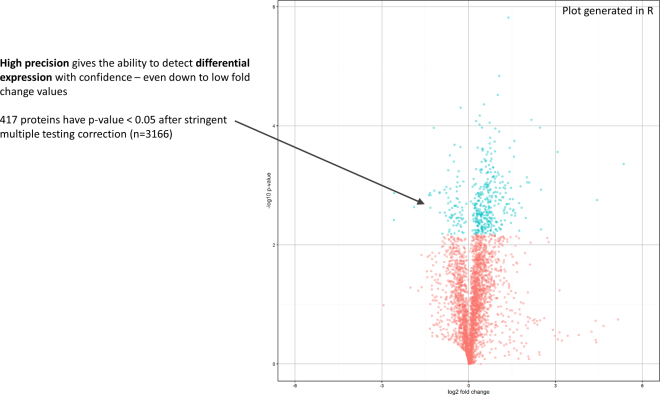 Figure 3: How the Progenesis workflow enables 100% matching and no missing values, meaning reliable statistics which will lead you to confident biological discoveries. 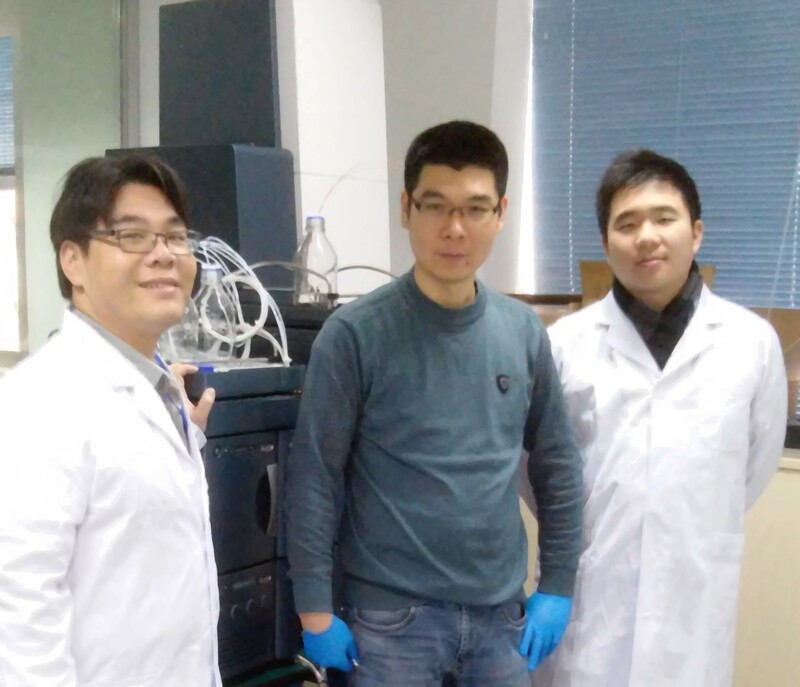 The second publication I’d like to highlight is significant as I believe it is the first to be produced by the Singapore Phenome Centre (SPC) based at the Lee Kong School of Medicine, Nanyang Technological University (NTU). 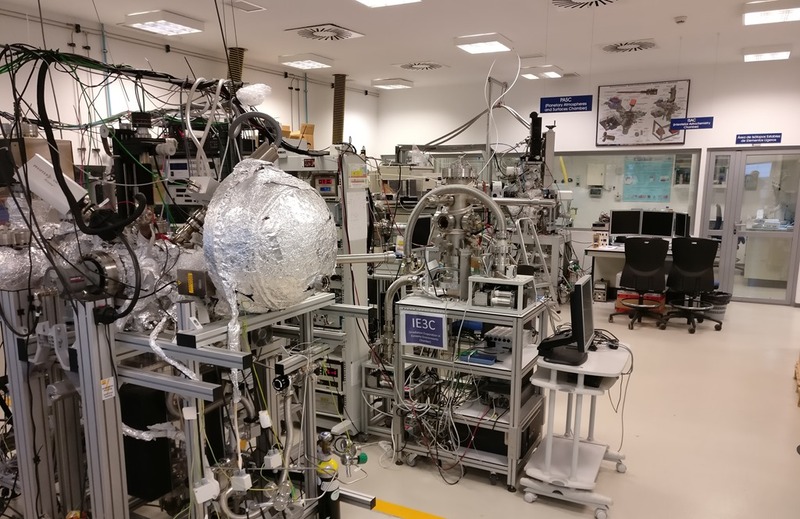 The SPC is a member of the International Phenome Centre Network (IPCN) and was set up in association with the National Phenome Centre at Imperial College, London and the Waters Corporation to conduct research in two main areas, clinical and environmental. This initial publication is in the environmental field and is concerned with profiling the metabolites and lipids that form the Soluble Microbial Product (SMP) contained in the effluent from Bioreactors used in wastewater treatment. Since SMPs can lead to issues such as fouling of membranes in the bioreactors, it’s important to understand their composition, origin and the system parameters that can influence their production. The experiment consisted of analysing filtered samples taken from a continuously stirred tank anaerobic bioreactor at intervals of 0, 4 and 48 hours after batch feeding it with a synthetic feed mixture. To ensure maximum metabolite coverage, liquid-liquid extraction was used to separate samples into polar metabolite and lipid fractions which were both analysed on positive and negative mode (three replicate injections per condition). Analysis was performed using Waters Acquity UPLC system with HSS T3 column for polar and CSH C18 for lipid separations, coupled to a Xevo G2-XS Q-Tof MS. Again, the power of Progenesis QI co-detection was used to process the data and find the compounds that were significantly changing in relative abundance between the different time points, as well as for identification of compounds of interest. For further multivariate analysis including OPLS-DA, data was exported from Progenesis QI directly into EZinfo. Identification used both Progenesis MetaScope and ChemSpider in both of which it is possible to search many databases for maximum coverage while filtering by isotope distribution and theoretical fragmentation analysis to improve discrimination of results. Due to good experimental technique and the alignment and co-detection capabilities of Progenesis QI, technical replication was excellent enabling very clear distinctions between the conditions as shown with PCA. Using multivariate statistics such as OPLS-DA and the S-plot (in EZinfo) it was possible to extract the compounds that contributed most significantly to the pair-wise differences between the conditions. Of these compounds, those that increased in relative abundance from 0-4 hours (fermentation stage) included both polar metabolite and lipid species while those that increased from 4-48 hours (methanogenesis stage) were all lipids, mainly phospoholipids and cardiolipins (diphospholipids). As this study was the first to include both polar metabolite and lipid SMPs, a more complete picture than previously of the metabolic processes occurring at different stages of wastewater treatment could be obtained. I’m sure we will see many more great publications citing Progenesis QI in the coming months so perhaps I’ll get the opportunity to give some further updates on them quite soon. 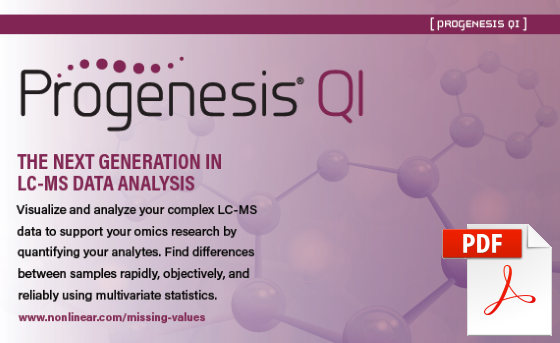 In the meantime I invite you to download Progenesis QI and see how it can help you to generate high quality data for publication. With the new year comes a new release of Progenesis QI, version 2.3. We are making this available free of charge to all our users running v2.0, v2.1 and v2.2. Here are 3 reasons you might want to upgrade. This upgrade will allow you to use Progenesis QI in conjunction with Symphony data pipeline, so you can conduct the most time-consuming parts of the informatics workflow in parallel to acquisition: Here’s a representation of a timed comparison using the conventional workflow compared to the Symphony workflow. 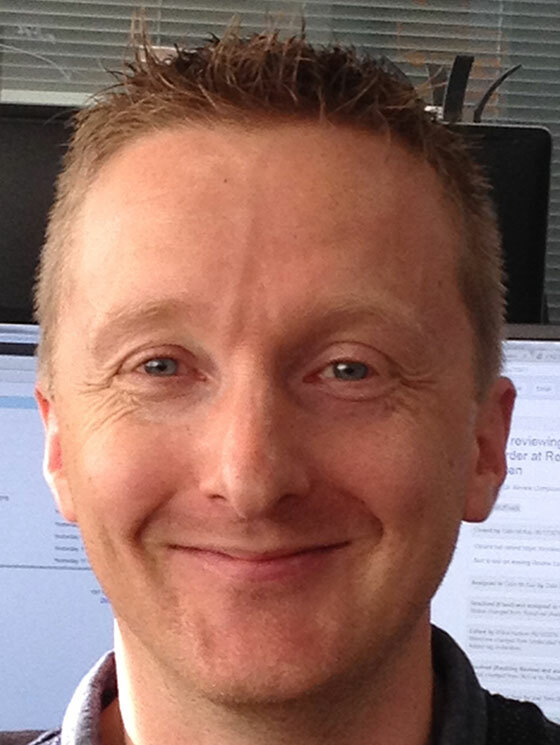 Paul Skipp, Associate Professor in Proteomics and Centre Director, Centre for Proteomics Research, University of Southampton, UK. Progenesis QI v2.3 has support for SONAR, an exciting new Waters technology that gives increased confidence and speed to busy mass spec/Omics research laboratories that need to get the answer right the first time. With efficient workflows, SONAR offers new possibilities, with an acquisition mode that collects MS/MS results from a Data Independent Acquisition (DIA) experiment. We have listened to our users and made some changes that make the Progenesis QI workflow smoother to use. With better zooming, improved flexibility using adducts and exporting known unknowns, Progenesis QI is looking in good shape for 2017! Would you like to give it a try? You can download v2.3 here or contact us if you would like to renew your maintenance plan. 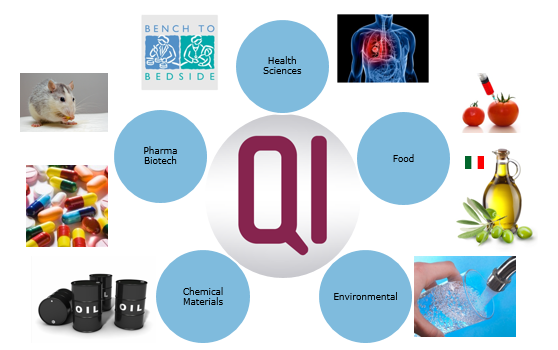 We very much appreciate your continued support and partnership in the further development of Progenesis QI. 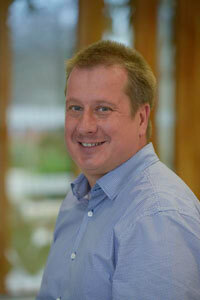 Janusz joins us with years of experience in mass spectrometry, having spent his career in the laboratory. 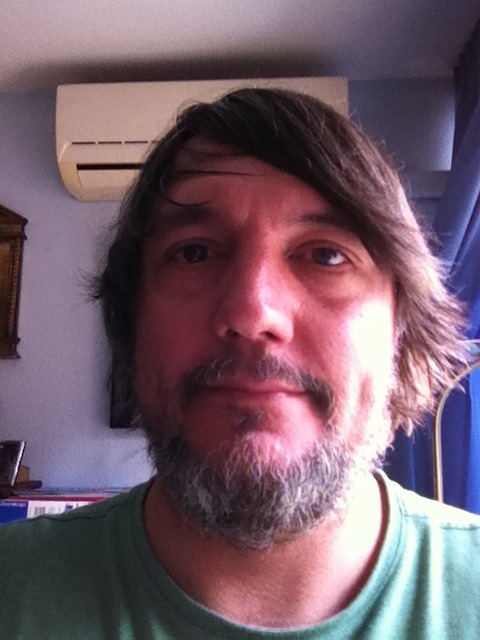 Prior to joining Nonlinear, he was working as Core Facility Manager in the Mass Spectrometry Laboratory at the Institute of Biochemistry and Biophysics, Polish Academy of Sciences, Warsaw. “I was born and bred in Wigan. I’ve been an Everton fan from birth, not being built for rugby! Since graduation from Newcastle University with a Genetics degree, I’ve worked as a Cytogeneticist in Leeds, Wellington (NZ) & Sydney (OZ). I subsequently worked for a company that supplied medical devices to the Cytogenetics and Pathology markets. Over the years there, I fulfilled many roles including service & support, QA and R&D test manager. I’m married to Donna and we have 2 kids, Noah and Alice. Unfortunately for Noah, he also supports Everton! When I’m not taxiing kids to places, I enjoy a round a golf, watching football and I enjoy drinking beer. Since joining Nonlinear, I’ve rediscovered a forgotten love of playing tabletop games and pool! You will be pleased to learn that we have lots of exciting plans for 2017, so do keep reading here. If you have any suggestions for the blog, or would like to contribute, please don’t hesitate to submit them to us – we appreciate your feedback and contributions. We are now nearly upon the holiday season and our offices will be running at reduced capacity from Friday 23rd December through to Tuesday 3rd January. Finally, we would like to wish you peace and joy at the close of 2016 and every success in your research for 2017. So how can we get people to quickly understand why Progenesis QI is different? In order to do that, researchers need to understand the major problem in Omics data analysis: the holes in experimental data – known as missing values – that can be introduced by inefficient software. So, to help us get our point across in an easily-digestible, quick-to-read format, we produced this infographic to help you understand what switching to Progenesis QI means for your research. Please do have a look. If this piques your interest, at the end there is a 16 minute video in which Dr Paul Goulding describes in detail the scale of the missing values problem and how Progenesis QI uniquely resolves this. Interested in learning more? Whatever instrument you use, why not download Progenesis QI or Progenesis QI for proteomics and analyse ALL of your data? 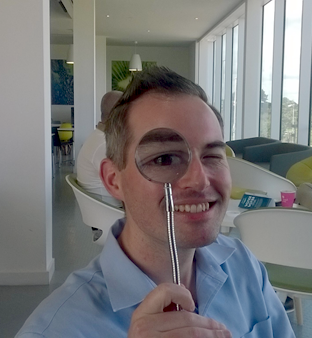 Metabolomics is a cross-disciplinary subject. Although 15 years have passed since it was first proposed, the field of metabolomics is still relatively young. Many challenges have presented themselves in the course of its development. 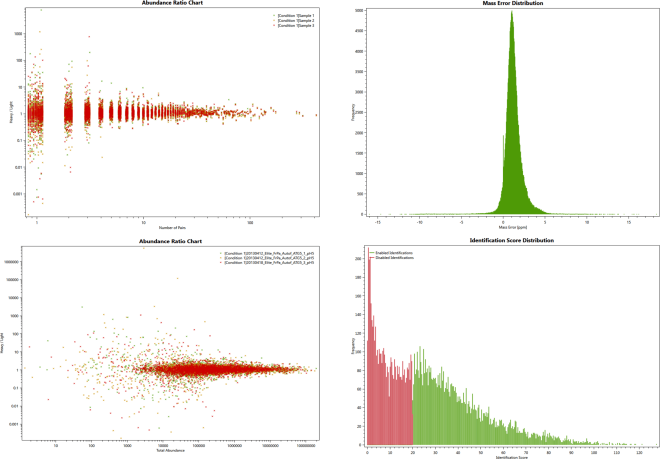 One difficult challenge lies in the processing of highly complex, multi-dimensional datasets produced by mass spectrometry. We are specialists in mass spectrometry and metabolomics. Our works range from clinical trials and molecular biology to method and technology development. Clinical studies and biological samples, collected by clinicians, are the most challenging. Not only have these clinical studies required a large number of samples (ranging from hundreds to thousands) to have adequate statistical power, but little control is imposed over the patients. Sample type and quality vary considerably. Some of those are longitudinal cohort studies. To handle these challenges, innovations are imperative. We choose Waters systems over other manufacturers, because of their technological innovations, their high quality of service in the UK and China, and their easy to use informatics tools. One of the technological innovations of Waters’ Q‑ToF systems is data independent analysis (DIA). Waters called their approach MSE and this was introduced commercially in 2007. During MSE data acquisition, the energy of the collision cell is dynamically switched between low-energy and elevated-energy states. This produces alternating composite mass spectra of all intact molecular ions, followed by chimeric mass spectra of all product ions. Similar approaches were adopted by other manufacturers subsequently, such as Thermo AIF (all-ion fragmentation) and Agilent All-ion MS/MS in their Orbitrap and Q-ToF systems. DIA was developed to address the shortcomings of data dependent analysis (DDA) and found applications both in metabolomics and in proteomics. However, processing of the DIA data comes with its own challenges. Progenesis QI is one software, in our view, that processes MSE data efficiently. 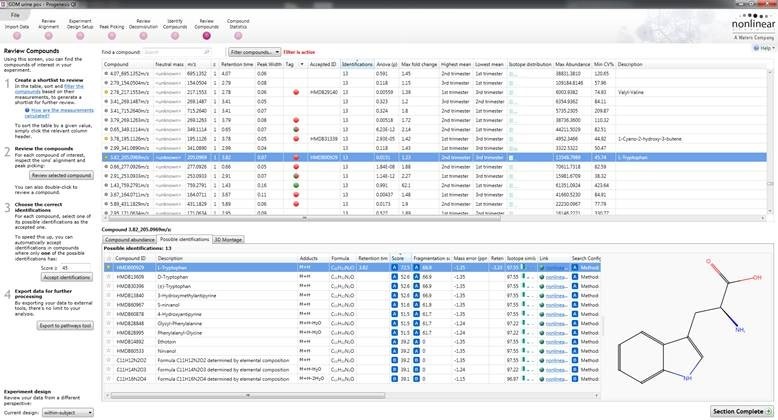 The Progenesis QI graphical user interface (GUI) has been designed to streamline data processing, from data importing, chromatographic alignment, peak picking, deconvolution, data normalization and spectral feature annotation to data analysis. This is in contrast to other R-based or MATLAB-based pipelines or toolboxes, which normally use a command-line interface (CLI). Though flexible and extendable from developers’ and power users’ points of view, CLIs, with their steep learning curves, deter general users, whereas a nicely designed GUI empowers users at all levels. 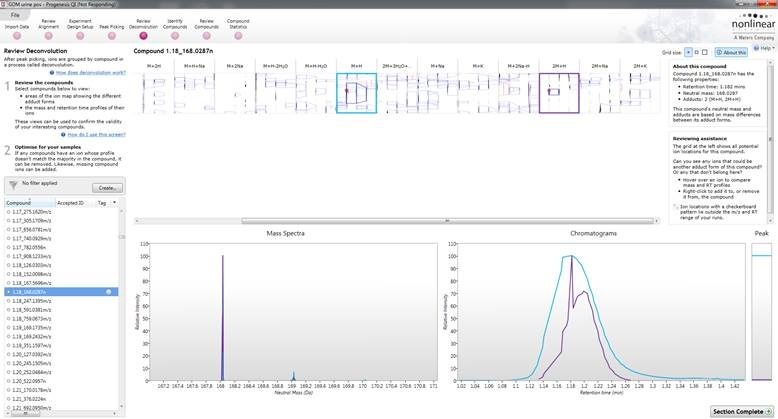 The Progenesis QI interface is not only easier to learn and use, but it allows users to fine-tune the chromatographic alignment and ion deconvolution. Commonly used statistical functions are available to assist data interrogation. Figure 1: Unlike other similar commercial or academic data processing software, Progenesis QI has both standard between-subject experimental design, and within-subject experimental design (repeated measurement of the same experimental subject). The latter design determines the p-value of a variable using paired-ANOVA analysis that eliminates genetic, diet, and/or environmental effects between experimental subjects, thus allowing us to focus on the disease or condition we are investigating and not the natural variations among our patients. Most popular data processing tools align chromatographs very well. It was not so several years ago. A challenge in chromatographic alignment is non-linear shifts of retention time of metabolites. The retention time shift could be relatively large in large-scale studies since the samples cannot be analyzed in one batch. MarkerLynx, introduced by Waters, aligned chromatographic data to an internal reference and assumed a linear retention time shift. This assumption rarely holds true for most metabolites from complex biological matrices. Consequently, the chromatographic binning window had to be set to a relatively large value and the results sometimes missed out important information. XCMS was the first software to allow non-linear alignment. However, MarkerLynx could still perform better than XCMS, which can only align chromatographic peaks with a high degree of similarity. Progenesis QI uses vectors to align chromatographic data. 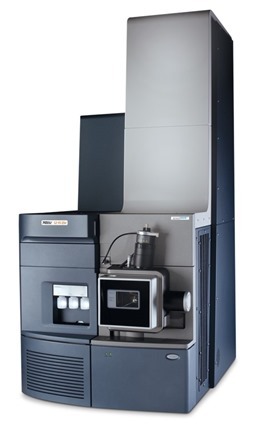 This greatly enhances flexibility to modify chromatographic alignment. This is because users can drag and add (or remove) vectors to improve the alignment of an individual chromatograph to a chosen reference run. Indeed, no other popular data processing tool highlights the problem areas of the chromatographs and allows users to fine-tune the individual chromatographic alignment without changing the program parameters and re-running from the beginning. 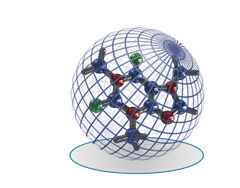 During ionization, a metabolite forms multiple ions, multiplying the complexity of the dataset. Data deconvolution algorithm in Progenesis QI performs ion deconvolution based on the user’s inputs. Reviewing ion deconvolution permits users to select (or deselect) additional adducts of a metabolite (see example below). Figure 2: Uric acid was detected as [M+H]+ and [2M+H]+ ions, but because the peak shapes were different, they were not grouped by deconvolution. However, these two ions both have the same retention time and so were assigned the same ID during compound identification. I was then able to go back to deconvolution, and make changes accordingly. Spectral feature annotation is probably the most difficult challenge in metabolomics (besides biological questions being asked). This is because metabolites are chemically diverse and genomic information cannot be used as a constraint to improve identification confidence. Unlike proteomics analysis, false discovery rate cannot be determined. 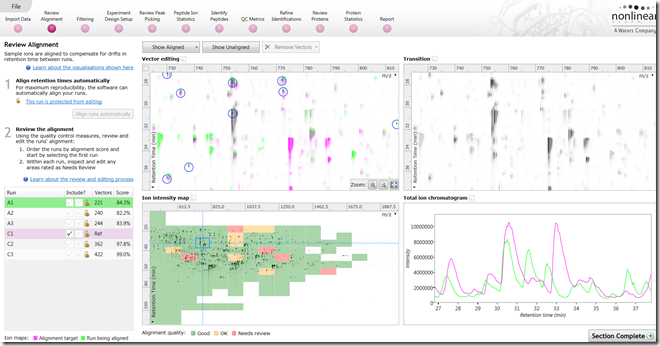 The MetaScope search tool in Progenesis QI is powerful and flexible enough to take the advantages of DIA data. Conventionally, fragmentation data are acquired by DDA. 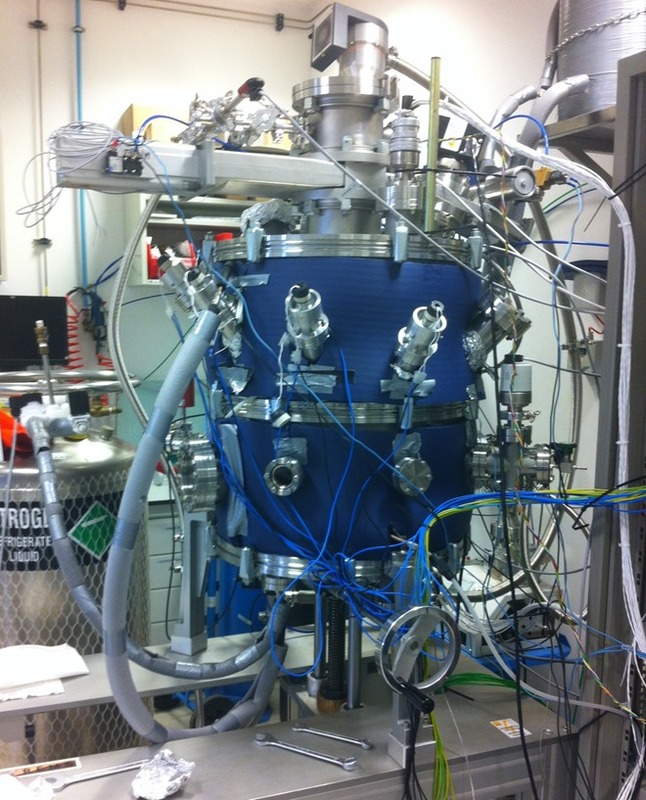 Herein, a hybrid mass spectrometer first performs a survey scan, from which the ions with the intensity above a predefined threshold value, are stochastically selected and fragmented. The DDA spectra are then matched against reference spectra in a database (e.g., MassBank, or NIST). Because DDA has a preference biased toward the ions having the highest intensity, less abundant ions are not fragmented or identified. This is in contrast to DIA, where all ions are fragmented non-selectively. However, spectrum deconvolution of DIA data is very complicated, which has prevented effective use of DIA data previously. Progenesis QI performs DIA spectrum deconvolution exceedingly well. In addition to fragment ions, other physical properties such as accurate mass, isotopic pattern, retention time and collision cross-sectional area are used to filter out all possible matches from a metabolite database. 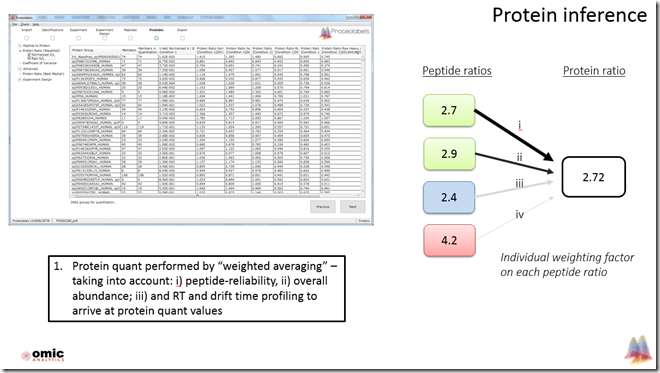 The structure of the selected metabolite is shown on the screen and an overall confidence score is calculated to assist users to select the most probable metabolite for identification. Further information is easily accessible via a link to the metadata of the selected databases. Users are able to make the most informed decision to accomplish compound assignments, manually. This approach significantly reduces the possibility of false possible identifications compared to other methods that are based only on accurate mass, and then report a long list of all possible metabolites for a spectral feature. Finally, accepted metabolite IDs can be easily exported for pathway search. Figure 3: Compound identification is in my view the most difficult step in metabolomics. Progenesis QI has features to assist me in conducting the assignments. 10 possible matches were returned with less than or equal to 1.35 ppm variance; it would not have been possible to select the correct answer confidently based on this alone. When I considered the mass error, dipeptides appeared to be the most probable answers. However, by taking into account the isotope similarity, fragmentation score, and retention time, I could confidently assign the spectral feature as L-tryptophan. If I am uncertain about the assignment, or want to know more about a particular metabolite, a link therein directs me to the metabocard of the database. If you also want to benefit from an easy to use interface that empowers you to have confidence in your ability to identify small molecules, download Progenesis QI for a free trial today. Finally, a big thank you to Kai P. Law & Ting-Li Han for their account. If you already use Progenesis QI and would like to share your experience of using Progenesis QI, please contact us. Here at Nonlinear Dynamics, we’ve always strived to keep Progenesis QI and Progenesis QI for proteomics vendor agnostic. This allows our users to utilise a single software package to analyse data from all of their instruments, and interface with a wide range of search methods and pathways tools. We achieve this through our plugin architecture, which allows you to install and update your supported data formats, search methods, and pathways tools independently of Progenesis. What are the advantages of the plugin system? interface with multiple vendors using a single piece of software – a key distinguishing feature versus other analysis software. remain up to date with new file formats and/or changes to existing file formats, without having to install a new version of Progenesis. apply novel search methods and pathways tools to their existing data analyses, thus staying up to date with developments in the scientific community. Progenesis allows you to import raw data from a number of different vendors and machines. 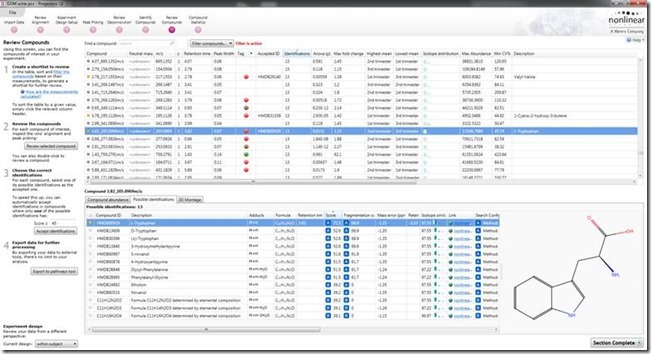 All imported data is converted to Progenesis’s unique internal peak models, so all types of data can be analysed using a consistent workflow. You can even combine data from different vendors in the same experiment (although this isn’t recommended as you may have trouble aligning the data). 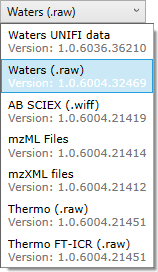 These plugins allow you to search for small molecules or lipids in your data set, using a wide variety of data sources. Elemental composition even enables you to elucidate compound composition without the use of a dedicated compound database. 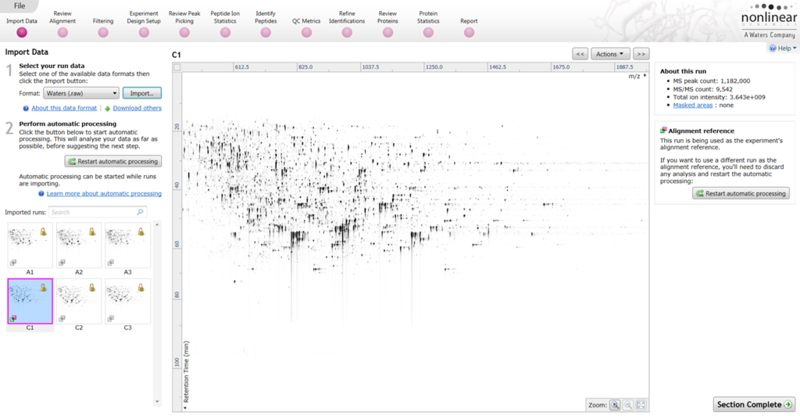 Progenesis MetaScope allows you to search SDF and MSP files from any source you choose, e.g. HMDB or PubChem. Progenesis QI for proteomics can perform peptide search and protein inference using a number of different plugins. These encompass both database search methods like Mascot, and de novo sequencing methods such as PEAKS Studio. 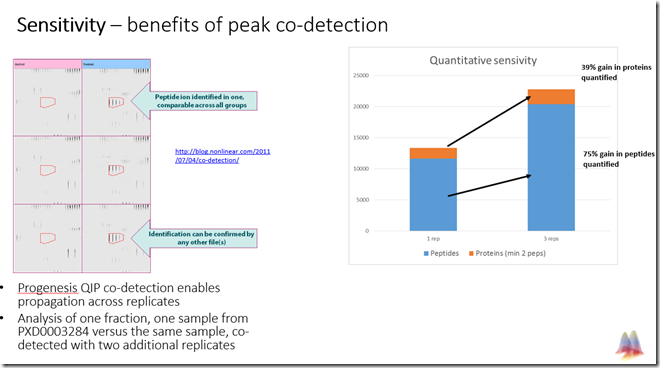 Inclusion list plugins in both QI and QI for proteomics allow you to target your ms/ms data collection for greater ms/ms coverage. Importantly, you can import new LC/MS runs into an existing experiment without having to replace peak picking and other analysis steps. 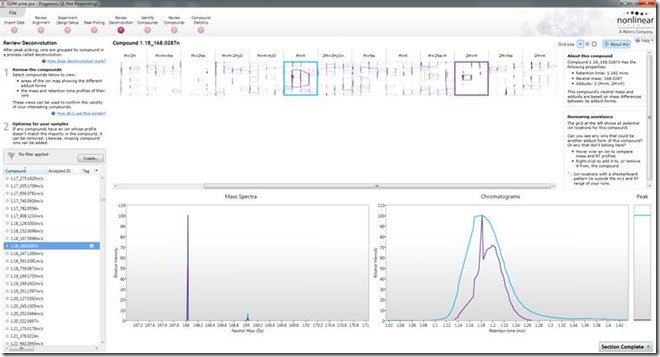 This makes the use of an inclusion list workflow a powerful tool to increase ms/ms coverage in DDA experiments. Progenesis provides reliable quantitative information about the changes in your experimental conditions. A number of pathways tools exist to translate such quantitative results into biologically relevant conclusions. Progenesis supports the following pathways tools, including the widely used IPA, and the multi-omics approach of IMPaLA. These are just a few examples of recent plugin releases we have made. As you can see, we regularly produce updates to Progenesis plugins, and develop new plugins when requested by customers. 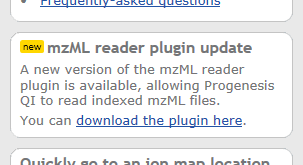 In April 2016 we released an updated version of the mzML reader for Progenesis QI, introducing the ability to read indexed mzML files, as requested by our customers. In January 2016 we released the IPA plugin for Progenesis QI for proteomics, giving users of Progenesis QI for proteomics v2.0 easy integration with this widely used pathway tool. 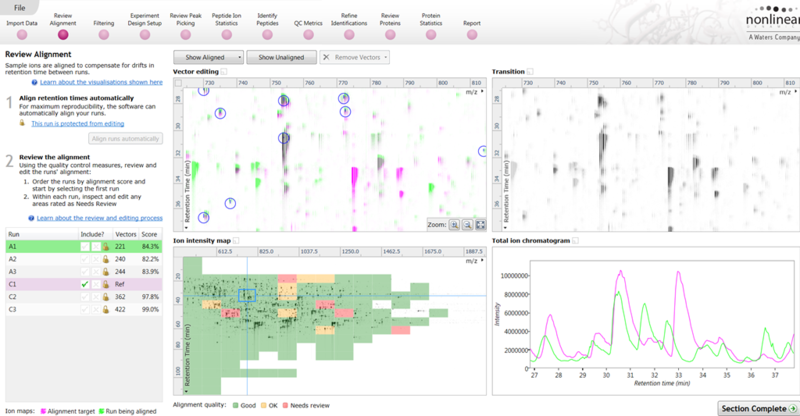 In November 2015 we released a new version of the Proteome Discoverer plugin, to support the newly released Proteome Discoverer v2.0 and v2.1. In November 2015 we also released a brand new Thermo Q Exactive inclusion list plugin for both QI and QI for proteomics, since the Q Exactive machine uses a different inclusion list format to other Thermo machines. Here at Nonlinear Dynamics we are committed to ensuring Progenesis remains vendor agnostic and supports the widest range of third party integrations possible. As such, we’re always happy to hear from customers if they wish to use Progenesis with a third party piece of software for which a plugin does not exist. Please get in touch if you have any ideas for new plugins, or improvements to existing plugins.